Even though our permanent innovative strategy classes us as experts in specialised products, we also offer a wide range of generic products. Our open choice of products complemented by a wide range of printing techniques, shaping and surface finishes are available to you with no restriction to volume. Our concept efficiently replaces glasses made with coloured cellophane. This process demands lengthy and costly manual operations to apply the cellophane, which often disqualifies the product due to economic or manufacturing time constraints. While conserving the same optical quality as coloured cellophane, we have perfected a process of printing directly onto a transparent film, which constitutes the frame of the glasses. Our manufacturing process is fully automated while remaining flexible to adapt to your volume constraints, from several hundred to several million. 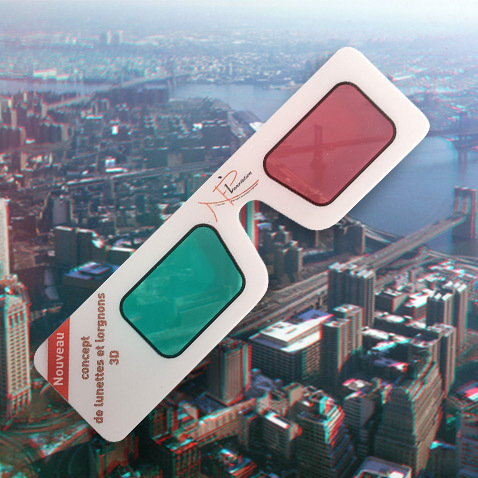 We can also create your anaglyph images. Available in different formats of glasses we offer a standard form made from an existing tool, or specific forms according to your designs. Mono material, manufactured either in PVC or transparent PET, our product is more easily recyclable than traditional glasses made of cardboard and cellophane, they are therefore bi-material, so it is necessary to separate the two materials before recycling.